The Bernina 1630 is truly a unique sewing machine with the built in feature of the Stitch Designer. 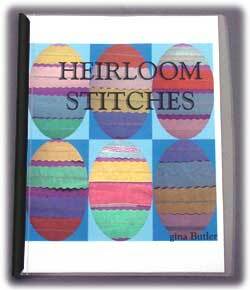 HEIRLOOM STITCHES is a booklet which can help you learn to use the Bernina 1630 Stitch Designer. Each stitch lesson progresses to help you learn the tools and possibilities of the built in Stitch Designer on the Bernina 1630. After completing the lessons you will have 25 NEW! and exclusive heirloom stitches (24 hemstitches and one single pass faggoting stitch).